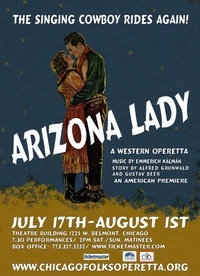 Even though it is ridiculously sentimental, watching Chicago Folks Operetta put on Emmerich Kálmán’s operetta Arizona Lady had me thinking of Bertolt Brecht. With this work, the Hungarian composer, Kálmán, sets up a counterfeit American landscape, much like Brecht placed In the Jungle of Cities and The Resistible Rise of Arturo Ui in the exotic (to them) United States. The inhabitants of Kálmán’s Arizona proclaim that the state is full of silver, gold, and cowboy songs, instead of water shortages and racial animosities. In a way, director Bill Walters’ production is surreal and oddly captivating, mostly overcoming its amateurish missteps. The plot follows the classic Viennese operetta structure, revolving around two pairs of lovers, one comic and the other a bit juicier (for the record, I saw the second cast for the show and the names reflect that). Lona (Juliet Petrus) rules over a ranch and possesses the mind of businesswomen, supposedly without any room for talk of love. Despite this, she is reluctantly attracted to the wandering, singing cowpolk Roy (Gerald Frantzen), offering him a job and the task of priming her horse, Arizona Lady (Maray Gutierrez), for the local race. 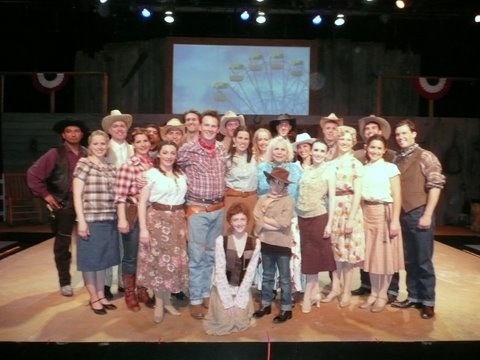 This storyline is crisscrossed with the courtship between young shop-owner Nelly (Kellie Cundiff) and the son of a beef magnate/cattle “intern” Chester (Matthew Dingels). Horse thieves, the Kentucky Derby, law and order, escaping to Mexico, and Prohibition all stir up the love stories, resulting in a cute, if somewhat vapid, tale of the Old West that never existed. This fictional world is actually very intriguing. Theatre celebrates unreality, so Kálmán’s West cobbled from Hollywood, Oklahoma!, and the opera halls of Hungary makes for a wholly unique theatrical experience. There’s plenty of guitar and saloon-style piano in the score, but this is joined by waltzes and Hungarian-folk melodies. Walters completely embraces the apparent contradictions, creating a universe that’s all its own. Part of August Tye’s great choreography is ripped from line-dance halls, while some of it smacks of traditional Eastern European dances. Yet all of it works. Gerald Frantzen and Hersh Glagov’s translation of the 1954 operetta, which has never seen an American production until now, is obviously done with a lot of love. While usually charming, the script occasionally gets too silly and audience interest flags. There is also some Spanish dialogue very awkwardly folded in. But they keep Kálmán’s somewhat bizarre world intact. There are too many stale moments for this Arizona Lady to be completely satisfying, a problem for Glagov, Walters, and the cast. But there’s a lot of passion on-stage over at the Theatre Building. And any indie opera outfit, attempting to do something so grandiose on the budget of a storefront, has a special little piece of my heart.